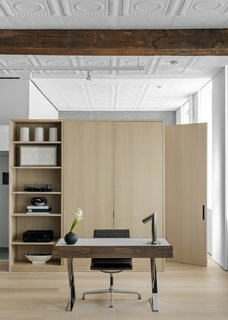 Designer Justin Charette fleshed out the interior of this apartment in New York’s famed SoHo district for a bi-coastal client who sought a streamlined, uncluttered, but warm pied-a-terre. The loft features high ceilings and tall windows that provide lots of daylight. Charette selected and arranged furniture to complement these features. 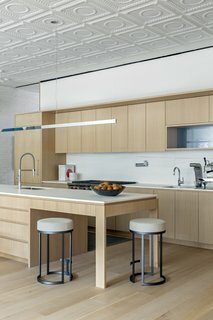 Architect Andrew Berman had previously renovated the two-bedroom, 2,800-square-foot apartment's kitchen, bathroom, built-ins, flooring, and structural elements. The client was looking for high-quality furnishings that were simple in form but masculine in aesthetic to complement the apartment’s existing features. The white oak floors are echoed in the cabinetry of the kitchen and the millwork of storage in the living/dining area. 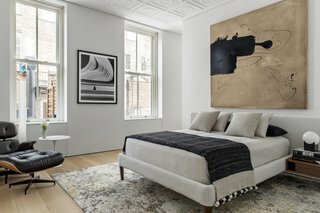 With these ideas in mind, Charette provided the interior design for the whole apartment—including furniture, light fixtures, rugs, artwork, modifications to the built-ins, and accessories throughout—all in under four months. 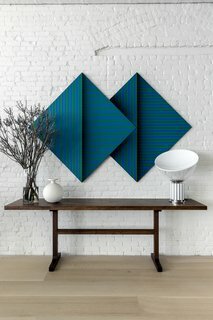 A bold green and blue artwork is posed above a dark wood trestle table in the dining area. 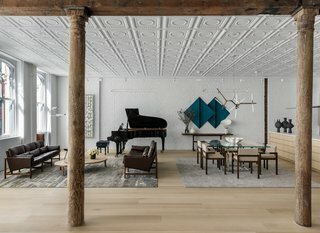 Charette struck a balance between the clean lines of modern furniture and the existing industrial and historical elements, including a pressed metal ceiling and solid wood interior columns and beams. Taking advantage of the high ceilings and plentiful sunlight found in the loft, Charette strategically placed furniture to create sight lines and maintain an airy and light composition. 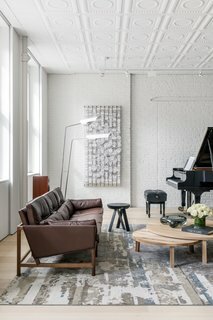 The apartment underwent a renovation by architect Andrew Berman before interior designer Justin Charette outfitted the interiors. 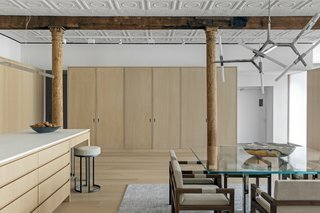 The renovation restored the existing tin ceiling and wood beams. The project's location inspired material and color palettes in line with this airy but masculine concept. The largely neutral palette has hints of earthy tones to complement the existing white oak flooring and furnishings. However, moments of color can be found throughout the space as it picks up shades found in views out the windows—such as a deep red from a brick facade. Charette also made sure to incorporate pieces from local New York designers and makers, including Desiron, Lindsey Adelman, and David Weeks Studio. The open-layout kitchen blends into the dining area and living space. Andrew Berman renovated the kitchen, but interior designer Justin Charette provided the styling and accessories. Charette is working with Homepolish, which pairs interested clients with interior designers. 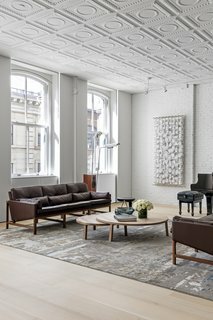 The brown leather couch is low enough to allow lots of light to filter into the room, but it also has a masculine edge and modern, clean lines. 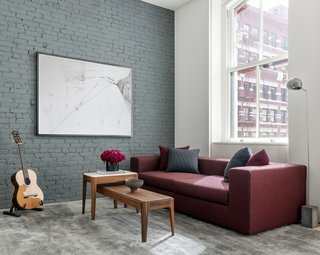 The burgundy sofa mirrors the brick facade outside, providing a moment of color against the otherwise neutral colors. One of the two bedrooms has simple furnishings and thoughtfully placed artwork, all in neutral tones made lively with texture and pattern. 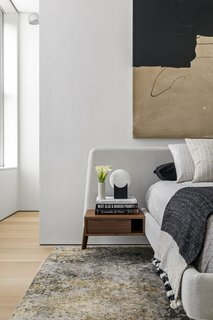 A headboard has integrated wood bedside tables. 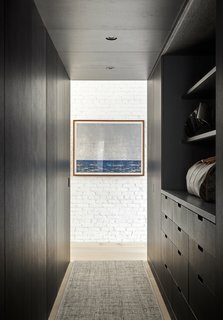 In contrast to the natural white oak millwork found in the living areas, the owner's private closet is stained in a dark color. The main bathroom, with its black-and-white stand-alone tub, can be closed off with sliding doors. 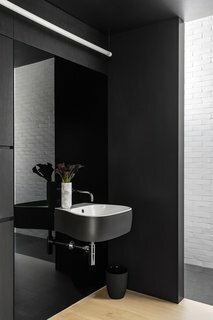 The bathroom is mostly black, allowing selected moments of white to really pop. 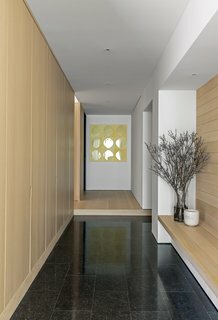 The entryway is an elegant lead-in to the rest of the apartment, with its stone tile floors, white walls, and white oak paneling and bench.